Immediately I was speaking to this gentleman, whom I call Vijay bhaiya and enquiring about it and he was kind to offer all details including a happy detail that is was the Jeeva Samadhi of Baba Mukteshwarpuri and that it was only around 70 kms from where we were speaking. That meant a Sunday could be spent at this place. On further enquiry I was glad to know that it was his very native village where he often visited and he and his dear son Arman excited mentioned that they would take me the next time they visited there. 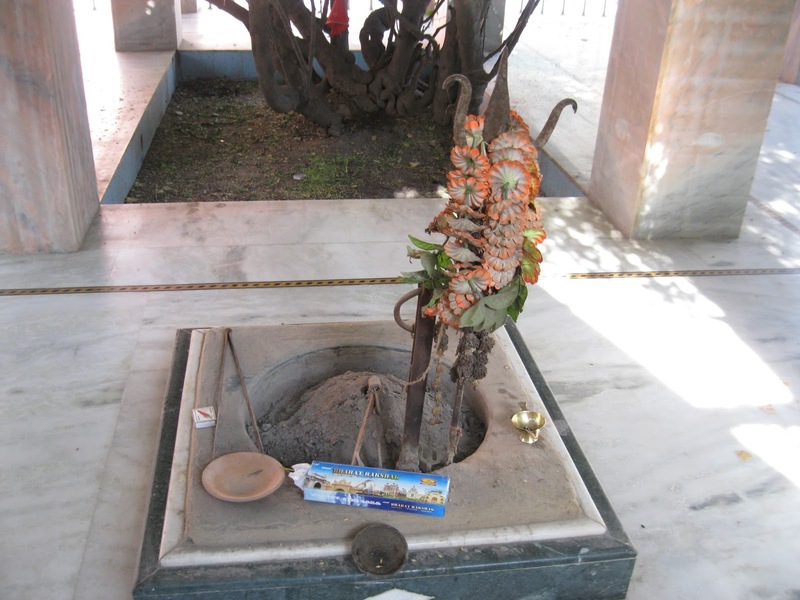 They were talking about an incident about three years ago, that when some people of the temple of Baba were trying to renovate something and were digging the earth, they came across the top head portion of Baba, and were amazed to know that they had struck upon the Jeeva Samadhi of Baba Mukteshwar. But I was even more excited and couldn’t wait. Speaking to two more of my friends here and with some research on the map, we three decided to leave early a Sunday morning and return by night. And so, we left Gurgaon at 6 a.m. a beautiful Sunday morning by car towards this remote village Kosli in Haryana. The navigation was not very difficult as Rahul had a GPRS-run map that helped us on the main highways but mischievously misguided on deep remote village roads. Kind villagers helped us navigate in places where the satellite failed. But these were never a disappointment because we had something more powerful to guide us and lead us, our Gurudev, Babaji and of course, the master himself whose Samadhi we were approaching. I had wondered once or twice the previous day if we needed to pack anything to eat as this was a remote village, but then forgot about it as I didn’t want to bother much on these things. While traveling, I was longing to stop and have some tea as it felt like ages having not had tea, but for some reason Rahul would not stop and we moved ahead tapping to the rhythm of bhajans in the car. 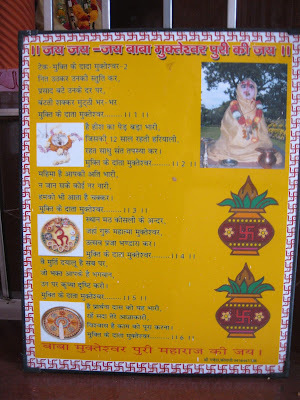 We entered Kosli at about 8:30 am and asked for directions to Baba Mukteshwar Puri’s ashram. Baba is known by every individual here and for everyone here Baba is their God. 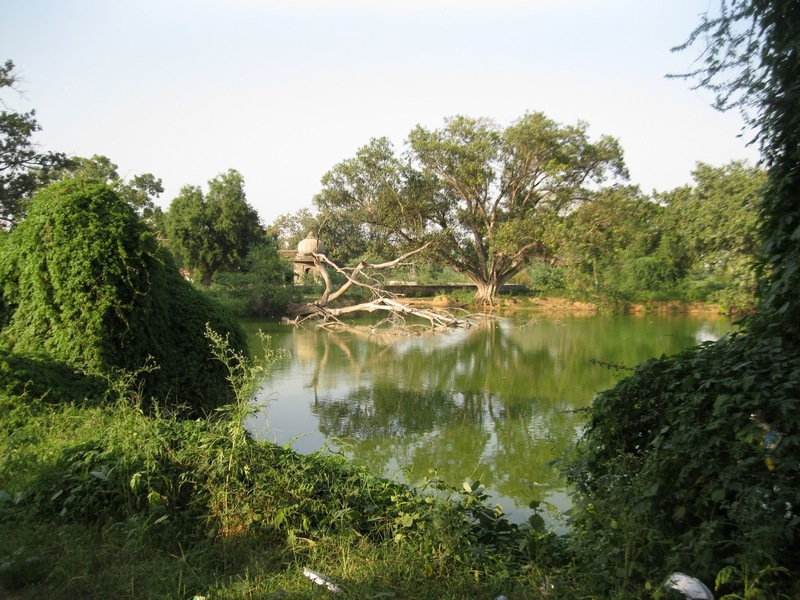 Many generations of the Kosli village have served the country and even now has about 70% population in the army and police. An astonishing fact here is that none of those who have joined the defense or police departments have ever died in any battle or on duty. Everyone here has the deep faith that Baba protects them all. 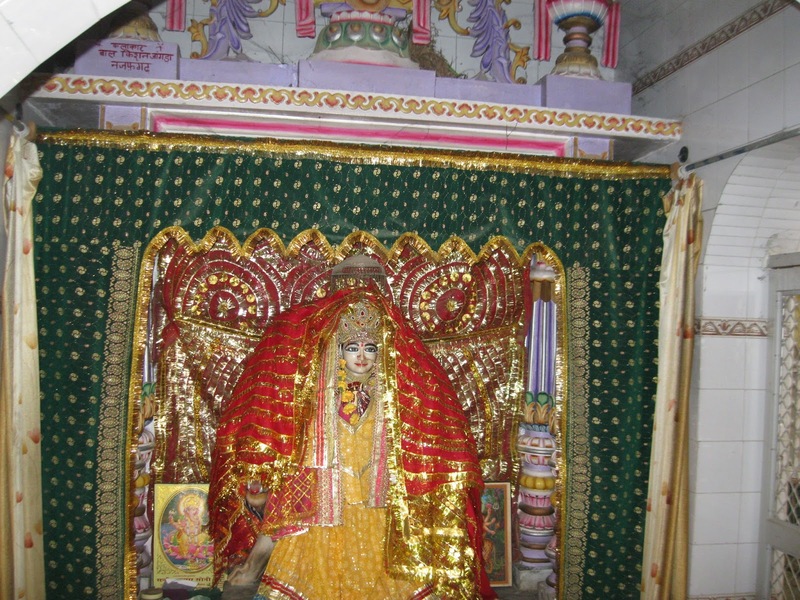 Many have glorifying experiences of Baba’s presence and protection in many ways during battles. Every individual who joins the forces, offer their first salary to Baba. 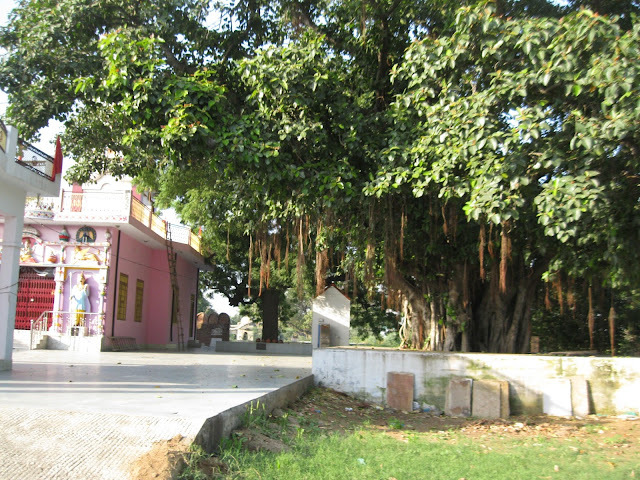 We were directed to Baba’s ashram that now comprises of Baba’s Samadhi and also many other Samadhis of His followers. It also has a tree that is also 900 years old under which Baba sat in meditation and did yagna. Parking the car outside, we entered in with our asanas and walking up a stepped place that looked like a temple, we found an elderly person with a sound physique sitting on a cot laid out in the open verandah with boundaries of small pillars raised to waist level. 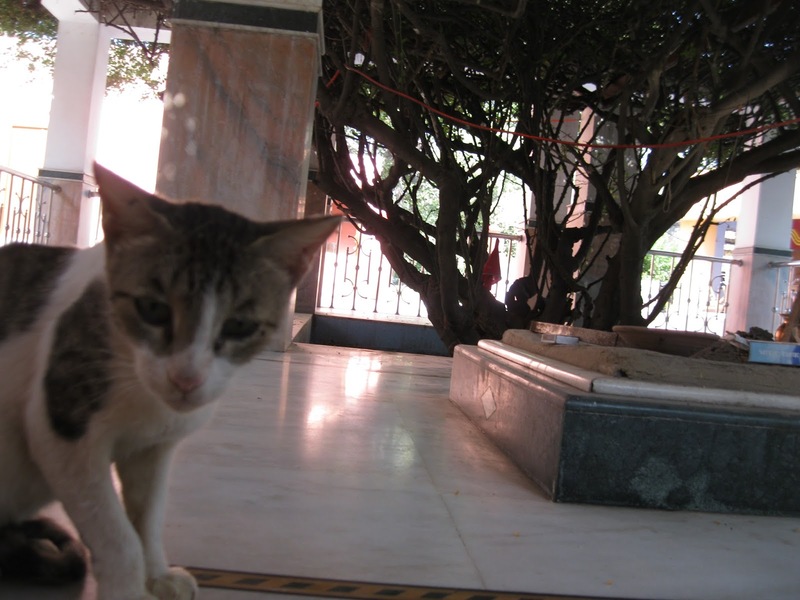 On taking his blessings, He (was the Baba who was looking after the ashram) directed us to go inside to Baba’s Samadhi. 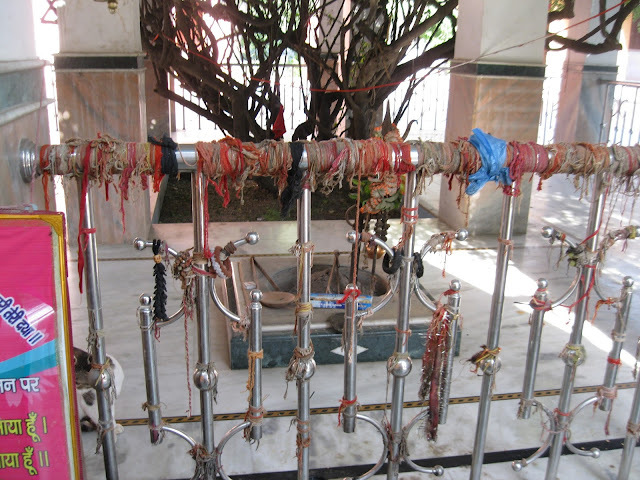 Just before entering on the left side we came across a very old cot on which Baba Mukteshwar used to rest. Filling our eyes with the energies permeating here, we moved in. It was a hall that had little things in. Further ahead the hall led to the kitchen and open space for eating (bhandara) and a left door led to Baba’s Samadhi. We walked to the Samadhi. Now the ashram had built a beautiful Samadhi of granite beneath which the earth had wrapped around the Jeeva Samadhi of this great saint in the lotus posture. There was a huge space around the Samadhi that indicated was made for people who wished to take rounds of it (parikrama). 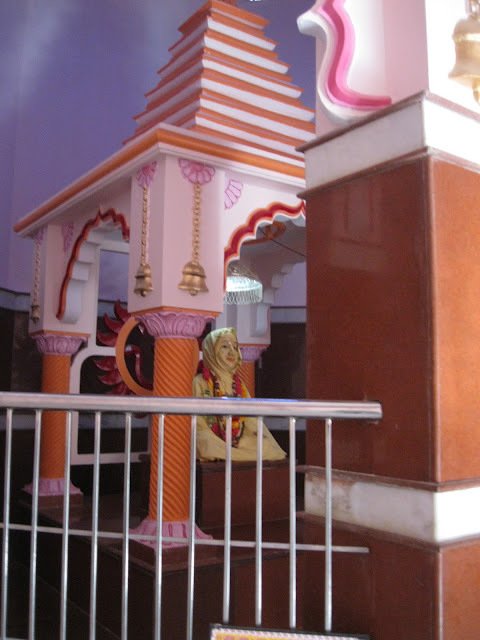 People walked in, rang the bell, did puja, aratis, prayed, offered incense sticks, money, sweets, etc, as per their love and beliefs. The atmosphere around was more like a temple and many villagers consistently walked in and out worshiping the Samadhi. Something made me feel that I must talk to the ashram Baba who was sitting out before sitting for sadhana and I went to him. He was very kind and asked about our whereabouts and upon telling him the same, he asked us for tea. My mind lighted up but faded out when the other two guys declined. Now, I realized why we were not stopping for tea – one did not drink tea at all and the other was not interested in it. Baba started talking about the glories of Baba Mukteshwar puri. Ranjit and Rahul joined too and we sat on the floor while Baba sat on his cot like a yogi in pleasant light orange robes and a similar colored turban on his head. As he spoke, every now and then the villagers came and fell at his feet for blessings and Baba gave them small packets of Prasad. He sometimes paused our conversation and asked about the well being of those who came to see. To some he reminded that they were not following the suggestions that were offered to them as solutions to their problems, to which they were apologetic. Some thanked as they had recovered from some illness and some came for solutions to their life challenges. To everyone, Baba was kind and soft-spoken. He continued his conversation with us, once he was done speaking those few sentences with those who sought his attention. To some he just offered the bhasm and did not speak but was immersed in his talks with us. 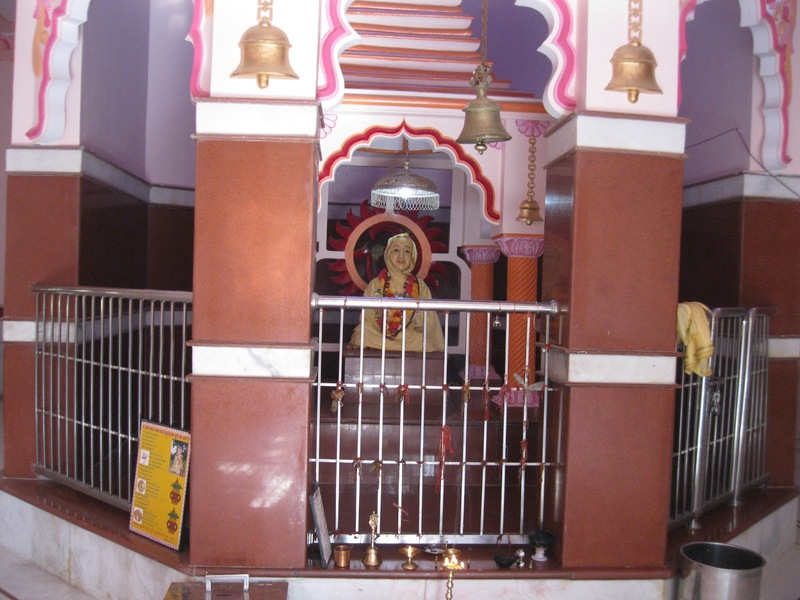 He attributed everything to the blessings of Baba Mukteshwar. 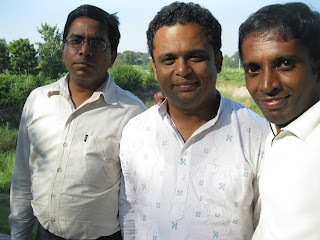 We enquired more about Baba Mukteshwar and he spoke lovingly to us in Hindi but in thick Haryana accent. He then asked us to sit as long as we wanted at any place we liked accept the main front portion of the samadhi that had a little steel gate that remained closed, because this was the place people continuously stood to pray or worship or offer something to the Samadhi, also adding that it could be disturbing. And it so happened, the ringing bells, the shrieks of children and their play, and the talks of people were distracting. I knew that this traffic of people was because it was a Sunday. But interestingly, we were soon lost in ourselves after connecting with the Jeeva Samadhi inspite of the distractions around. Soon it was close to lunch time, and I got up and walked around and saw many other samadhis. An old tree looked very inviting and I sat down under it for sometime observing the numerous squirrels that ran and played around the tree and the ants that were busy in their own world. 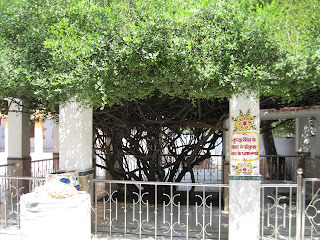 I then walked up to the holy tree that had witnessed the Siddha’s physical presence centuries ago and filling my eyes with this blessed tree. 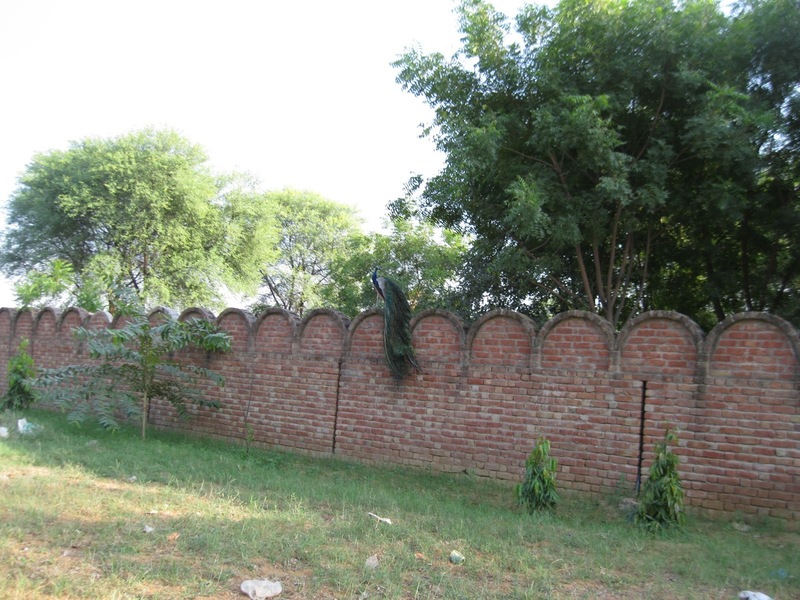 I walked along with Ranjit to a beautiful green park behind the ashram and sat talking on the bench, while birds chirped above our heads in the beautiful sunlight that shone through the trees. I looked up and high up spotted a huge peacock perched on one of the high branches of the tree. A Rajashtani man with a huge turban on his head, who was in seva of the present Baba came and sat with us speaking about Baba Mukteshwar. He had been there since childhood and was filled with courtesy and simplicity. Soon a boy came running and mentioned that Baba was calling us as lunch was ready. We were led to the kitchen space and soon had steel places filled with rotis, puris, dal, puris, sweet, and a huge bowl of curds. Villages are famous for ghee and curd and that too out of pure cow milk. Baba came to ensure that we were served food and left. It was a great satvik meal and soon we were sitting outside with Baba again, who spoke more about the ashram and how it was constructed. 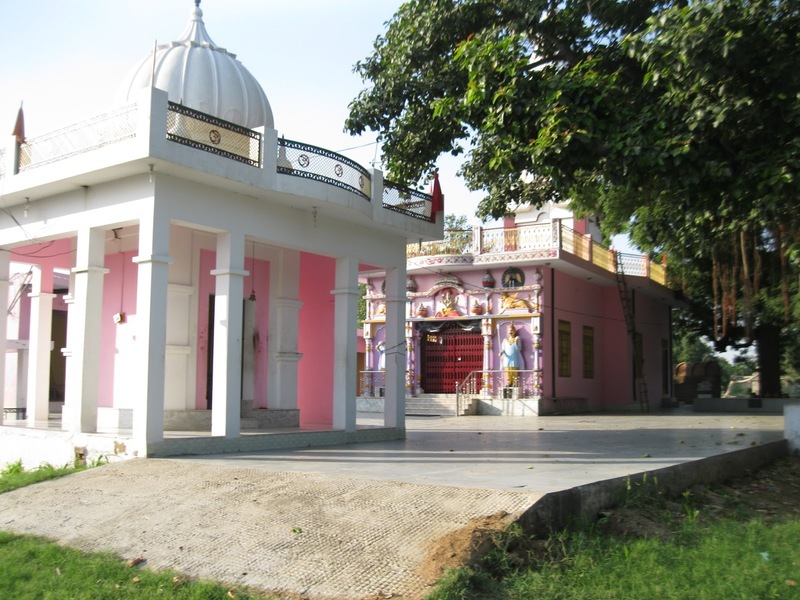 It was a small place and people who came to visit the Samadhi had a difficult time since it was a very congested space and that is when the people of the village got together and formed a trust and began work here. 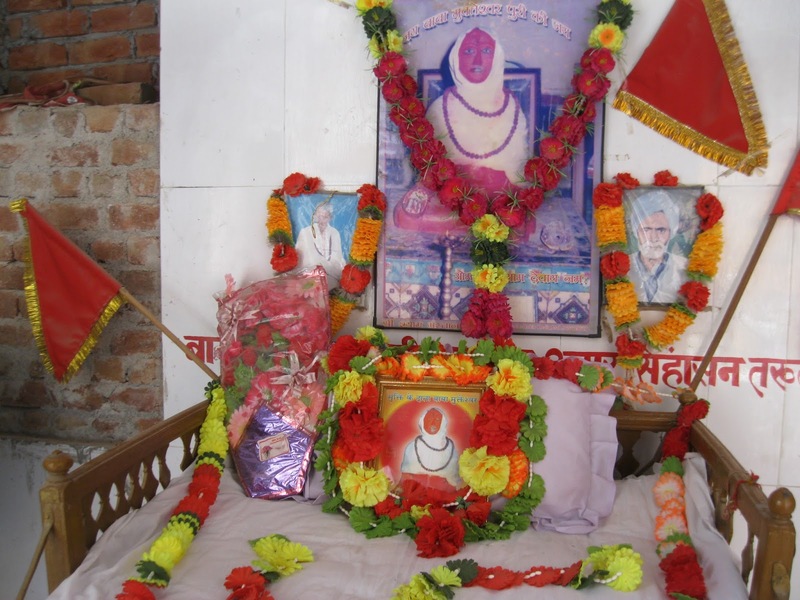 It was during more renovation to increase the space that the Samadhi happened to be dug about three years back and this incident had happened in the presence of the Baba we were talking to. 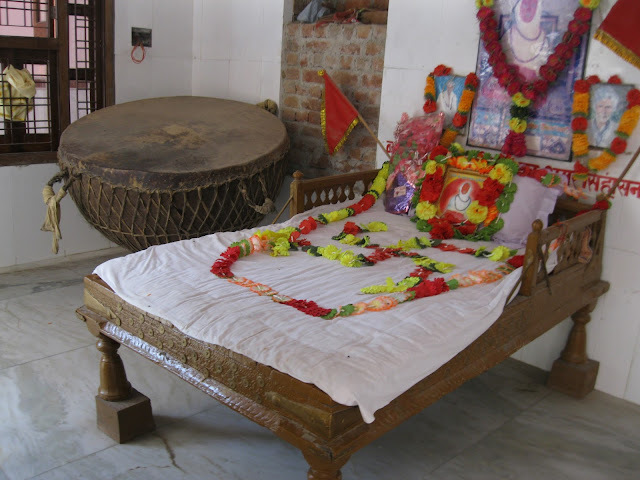 We came back to the shrine and expressed our desire to Baba to meditate for some more time as he laid on his bed and rested. We went back into the Samadhi shrine and meditated. It was evening and we then got up and came to Baba's cot to take leave. He was still resting but when he became aware of our presence he got up and sat and insisted that we must have tea and leave. I did not resist but supported Baba's view on tea this time, and soon tea was prepared for us and offered. I felt as thought Baba Muktheshwar had listened to my plea for tea and sipping tea from the steel glass, I mischievously looked at Ranjit who never wanted to look back into my eyes, because he was all the time saying he “never” drank tea. Any offerings from a holy place or shrine or a holy person is always accepted as Prasad and so did we all. Now, he had too. My heart was giggling out. As we spoke many people came and sought his blessings and periodically he interupted his chat with us, attending to people's concerns and giving them advice. But the moment they left he continued from where he had left. 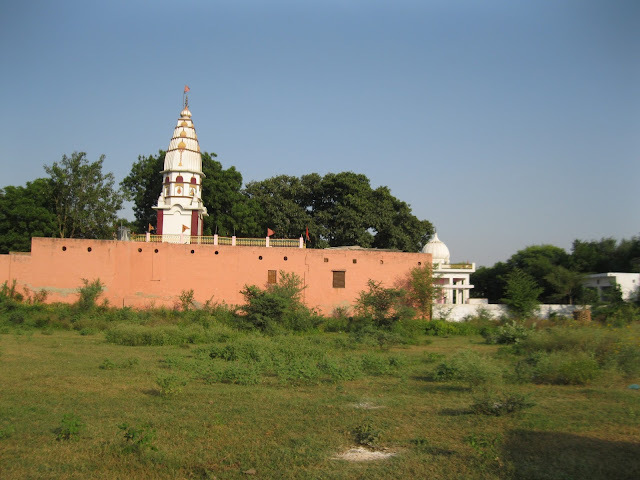 He even spoke of his own Guru from Rajasthan, who had deployed him at that shrine since the villagers had requested his Master for a person there. He spoke of how his Guru lived on rain water and mentioned that he was currently away in the forest for some few months for his tapas. Soon, it was time to leave and we took leave of him and he blessed us with some prasad and an audio CD, that was perhaps the only one left with him, that contained bhajans in the glory of Baba Mukteshwar. 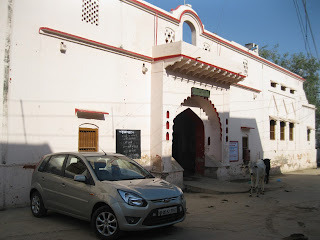 We left this place and drove to two other very ancient temples of Shakti and Shiva. 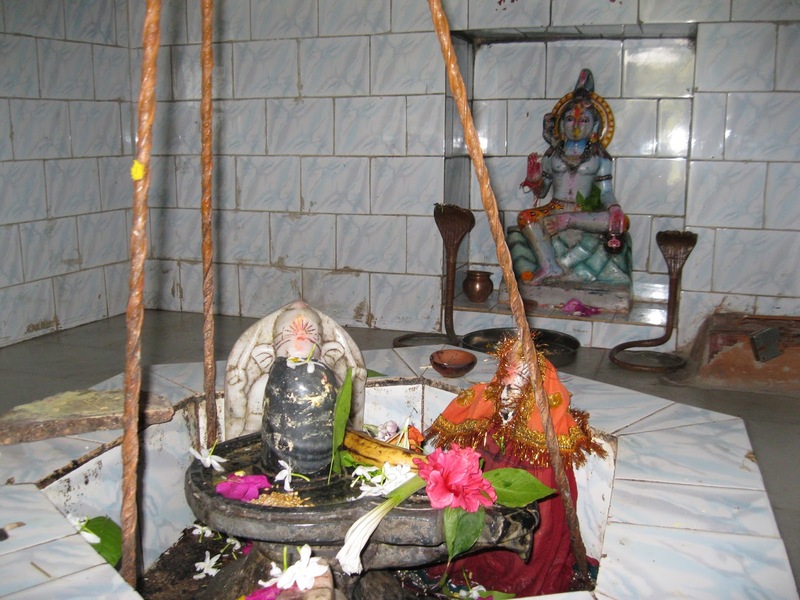 The shivalinga in this temple was supposed to be centuries old and probably the worship of the Siddhas. We also heard that it was installed by Bhima. Just a few meters ahead is a Shakti temple. Here also the Baba who looked after that Shiva temple insisted we have tea. This time, we were all really full and i ran to the person who on orders for tea was making some. I wanted to tell him to not make or make very, very less. But he said he had already prepared three glass full of tea. Without a word i came back. This time before i could complete my sarcastic smile to Ranjit's tea problem, he immediately poured out his cup of tea into mine and keeping just a very little in his cup. Baba did not see this act of his and i could not put back the tea into his glass as he held up the glass close to his body giggling his heart out. We had the tea and thanked Baba and left. We meditated in both these locations, that are also associated to be as old as Baba Mukteshwarpuri, but now renovated. We soon and left Kosli. As we travelled I wondered about why was I even thinking and planning of packing something things to eat because of the thought that we were going to a remote village where chances of getting food and probably clean water was a question mark. We ended up having the best meal, tea, rest, and care by the Divine. What more could one ask? Our gratitude to our Babaji whom we invoke in every action and who guides us in everything.